NEW ORLEANS – It’s finally time for the 2017 NJCAA Division I Cross Country Championships. The best of the best in NJCAA Division I travel to Fort Dodge, Iowa this weekend to find out which individuals and teams will earn the right be called champions. Allow this post to serve as a preview of sorts for this weekend as we’ll hash out the most recent National Coaches’ Polls that were released Wednesday by the U.S. Track & Field and Cross Country Coaches Association (USTFCCCA). 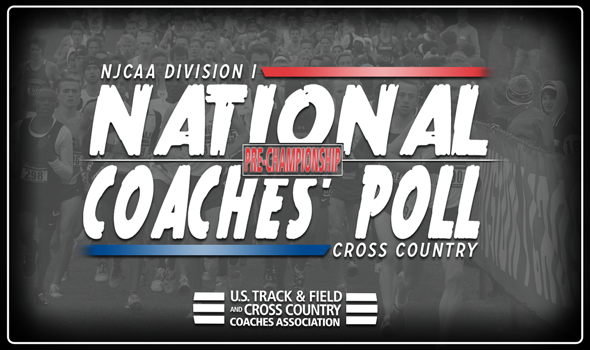 For those who are new or need a refresher, the NJCAA Division I Cross Country National Coaches’ Polls are voted on by 10 coaches from around the nation. Points are assigned to each spot in the poll and the team with the most points is No. 1, followed by the second most and so on and so forth. If the most recent NJCAA Division I Men’s Cross Country National Coaches’ Poll has any bearing on what could happen this weekend, it’s going to be a four-team race between top-ranked Iowa Central, No. 2 Central Arizona, No. 3 South Plains (Texas) and No. 4 Paradise Valley (Ariz.). All four of those teams separated themselves from the pack throughout the season and each sit with more than 200 points in the most recent National Coaches’ Poll. The Tritons, who are hosting the meet this year, own eight out of the 10 first-place votes given out by the electorate. Iowa Central last won the national title in 2015, which completed a back-to-back run by Dee Brown’s program. Anything can happen out on the course, though, as the Tritons were favored last year but Central Arizona put five in the top-25 and won the crown. The Vaqueros also happen to have the remaining two first-place votes in the most recent index. Central Arizona is without 2016 individual champion Gilbert Kigen (who is now at Alabama) and Jorge Perez (third overall), but has reloaded with Ikageng Gaorekhe and Manuel Olivo-Quinones in those top-2 spots. Two men who finished in the top-5 last year do return and they should be considered favorites to win the individual title: Cloud County’s Moses Dirane (second last year) and Iowa Central’s Karim Achengli (fourth). Achengli has been named USTFCCCA National Athlete of the Week four times in 2017. Now if a team other than Iowa Central or Central Arizona wins the team title, it will be the first time that happened since 2011. Paradise Valley won it that year and enters this meet ranked No. 4 in the nation. Iowa Central is heavily favored to win its first team title since 2013. The Tritons enter this weekend’s meet with all 10 first-place votes in the final National Coaches’ Poll of the season. Sitting behind Iowa Central in the poll is Central Arizona, El Paso (Texas) and Cowley (Kan.) County. The College of Southern Idaho rounds out the final top-5. Last year the race for the team title was incredible as the top-4 teams were separated by eight points or fewer. Lansing (Mich.) only won by three points over Central Arizona and El Paso. If the Stars want to repeat in 2017, they have their work cut out for themselves. Lansing (Mich.) enters the meet ranked seventh in the nation. From an individual standpoint, Sandra Szpott of Garden City CC is the top returning finisher. Szpott took third last year behind Leanne Pompeani and Susan Ejore. Also returning is El Paso’s Shalet Mitei, who finished fifth last year. Look for Iowa Central’s Adva Cohen to compete for the individual title as well, especially after she was named USTFCCCA National Athlete of the Week three times in 2017. Other National Athletes of the Week that could be a factor include New Mexico JC’s Esther Gitahi, Colby (Kan.)’s Winnie Kibet and Pima (Ariz.)’s Katherine Bruno.